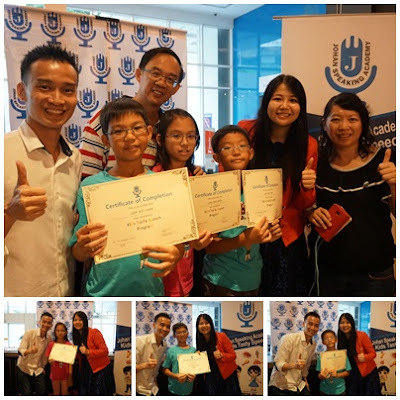 Last weekend, Mommy Jane brought 3 Little Angels to join the Kids Tasty Speech organised by Johan Speaking Academy. Instead of the normal 1.5 days Kids Public Speaking workshop at TTDI that they usually went, this round Johan Speaking Academy had brought the finale of the 2nd day workshop to a REAL Restaurant to give kids a real life experience of working in a Cafe ! My 3 Little Angels had became the Little Waiters and Waitress of the day at Luscious By Lisa T cafe which located at 1 Mont' Kiara. After experience their services, Mommy Jane felt that they had performed way better than the usual waiters and waitress that serve us in any other restaurant. I'm sure you'll agreed with me too and hopefully the children will become the example to all the Waiters and Waitress in Malaysia to serve customers better. What will they learn from becoming the Waiters and Waitress on that day ? Let me share with all of you. I can see the collaboration between the teammates. 2 children in a team and both had different role playing and they work together to accomplished their task successfully. My Little Angels learned how to communicate with customers with confidence and without fear even though all the customers there are totally strangers to them. They welcome every customers who came in to the cafe with a friendly smile, lead them to their seats and taking orders from them. They even recommended some of the specialty that are available at the cafe and tried to fulfill the customers special request. 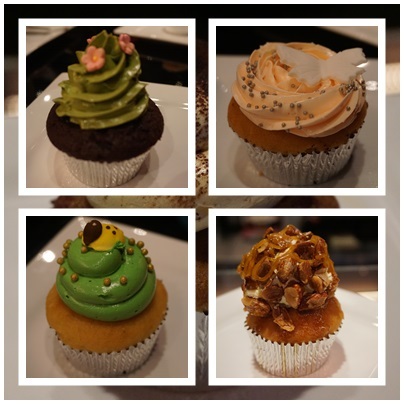 Since Luscious cafe had a promotion for a combination set of a cupcake and a drink for RM15 nett, Mommy Jane had order a set to try it out. After enjoying my yummylicious tea time, the children came to me to ask for feedback and ask me to rate for the food and the services. To test them out, I rated them with 1 star. Instead of getting angry, the children were trained to received critics well by Teacher Johan and ask for room for improvement. Overall, Mommy Jane was quite satisfied with the services and the food presented. Thumbs up to all the kids and the cafe who had provided the opportunities for the kids to explore themselves in the role playing. The children had their real-life experience becoming the Little Waiters and Waitress for the day for 2 hours and some had even served up to 3 customers. Even though this is their first time in this role playing, I bet all customers will agreed with me that the kids had done a good job. 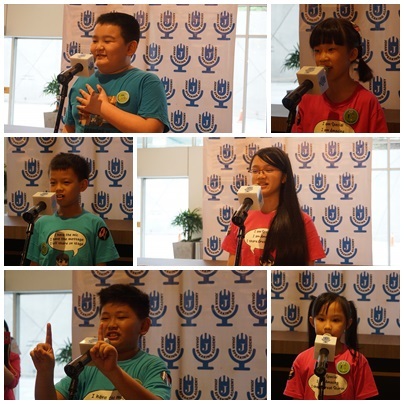 The live finale was the Kids Public Speaking presented in front of the parents and customers after the tasty speech event. All the children include my 3 Little Angels had introduce themselves well, speak out confidently on their favourite food and let us know their ambition. They also express their love to their parents publicly without fear. My heart was touched hearing it from my 3 Little Angels and I was so proud on them. Do start them young by start them now. 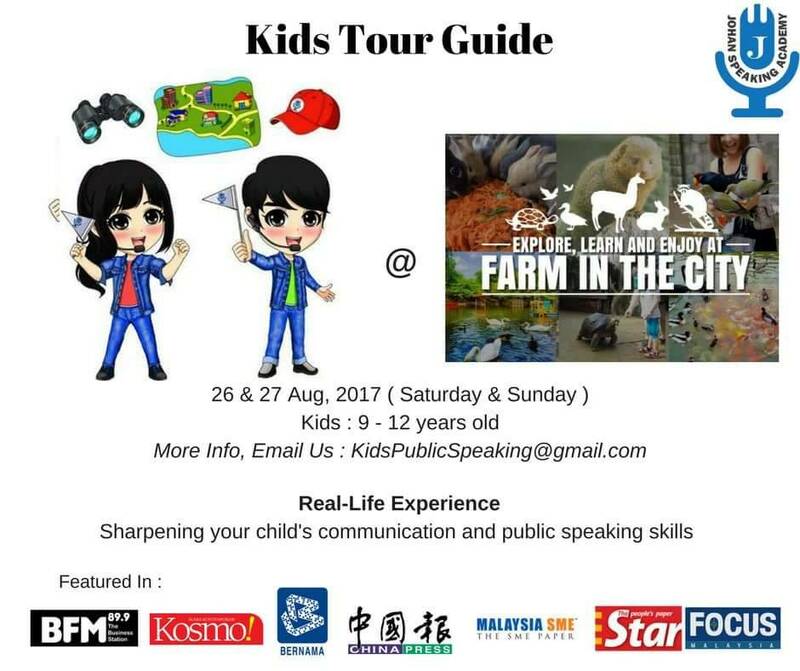 If you want your child to have a real-life experience too, do register them to become Kids Tour Guide where they will explore, learn and enjoy at the Farm in the City on 26th and 27th August 2017. For more information, do email to them at KidsPublicSpeaking@gmail.com or check out their website at www.kidspublicspeaking.com. very good experience for the children. T.H, indeed it is to build their confident. This is such a meaningful event! It certainly helps the kids build better confidence and learn how to communicate with people even though those are not whom they are familiar with. They should organise more of these events! Yanrula, agreed with you. The kids can enjoy while learning. Good that kids is being expose to all this. Can build up their confidence level. Cindy, that is the reason why I expose my children on this programme. Good that your kids are brave and can talk to others. Not all kids can be waiters or waitresses. Linda, they really brave and I really salute them. for a mommy with 2 kids i find this activity in so amazing. it sure build them confident adn positive self esteem..
Raihana, you're most welcome. I'm sure your kids will enjoy it too. It was a really fun activity to let your kids take part on this! Can help and guide the kids on boosting confident and talk more in public. Ms Sham, I'm sure your kids will benefit from the programme. oh, wow! this is really one-of-a-kind initiative! I bet this is absolutely a good exposure for the children to build their confidence talking to public. great! 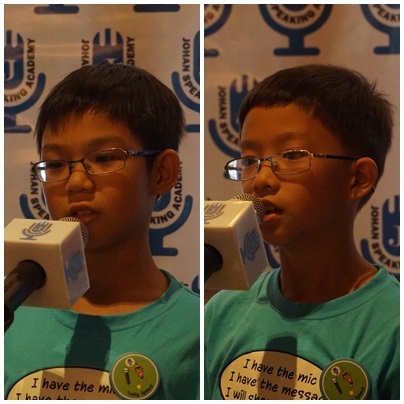 Hasif, I;m impressed with their programme too. Shafywah, agreed with you. They have school holiday programmes too. great exposure to the kids. when my kids grown up little bit, i would love to bring them involve with this kind of events. Shamiera, you should coz' it will help out in their growing up period. self confidence for the kids! great knowledge for them.. how i wish i can send my lil girl to this kind of programme..
Nooraini, sure you can. Do like them at their FB to get more updates. I love the idea that they try to implement. This will enhance the kids confident level and boost up their speech build. Zayani, the programme is unique and cater to help our children in every way.